Today in Hamburg, Commerzbank presented its market assessments of the wind energy market, ahead of Wind Energy Hamburg, which takes place from 25 to 28 September 2018. “We continue to observe a robust global expansion in renewable energies with a further decrease in production costs,” is the conclusion drawn by Berthold Bonanni, head of the Energy unit (CoC Energy) at Commerzbank AG. Regionally, Commerzbank forecasts strong annual growth in the Asia-Pacific region, and in particular in the offshore sector. In contrast, it is expected that Germany will see a brief decline in 2019, however growth of the onshore wind sector in Germany is expected to normalise from 2020. The global trend of competitive bidding procedures puts pressure on remuneration rates. For example, the number of countries which utilise competitive bidding has increased from 64 in 2015 to 84 in 2017. In the EU this has been mandatory since 2017. “In our experience competitive bidding leads to lower remuneration rates because pricing is closely linked to the decline in production costs,” observes Bonanni. Commerzbank AG, with its Center of Competence Energy (headquarters in Hamburg), is one of the leading financiers of renewable energies with a loan volume of around €4.5 billion in project financing and around €0.7 billion in corporate financing. Commerzbank has financed ca. 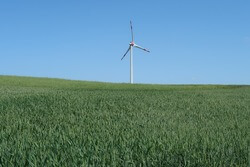 15% of the wind capacity in Germany to date.